It’s not hard to raise good readers when great books are available to us in so many ways. No longer we need to drive to the library or keep buying books galore. In our family, we are obsessed with books! Audiobooks! Picture books! Chapter books! Board books! Great books! Classic books! We just love reading. But not all kids love books. In an age where kids are glued in front of the TVs and video games, how can we raise good readers? Raise Good Readers By Making Reading Part of Your Daily Routine! 1 – Read aloud to your children as often as you can! We read aloud as part of our morning routine, we love to imagine the stories and discuss it afterward. But I can read aloud to them all the time so we also listen to audiobooks during our lunch breaks, then we try to add some more reading late in the afternoons and we read before bedtime as well. I believe I got my love for books from my dad who instead of reading me fairy tales often read me from an encyclopedia set! I am sure my love for books and history, in particular, came from hearing my dad reading me stories about Cleopatra, Napoleon, reading about the Seven Wonders of the World and the Suspended Gardens of Babylon, etc. Gather all the children books you have around the house and ask the children to help you create their own mini library. This will be an exciting family project. While you gather and sort the books, ask your children which ones are their favorite and why? Spark some conversation about books and even read some of the stories to them while they sort out their books. Sort the books into subjects and themes. I find that my daughters love fairy tales while my son loves to read history and science related books. This will make it easy for your children to find where their favorite books are. It doesn’t have to be something fancy. 3 – Have Book Baskets Around The House. We have a big book basket we call our “morning basket” right beside our couch in the living room. In it, I keep my youngest’s favorite readers, books I’ve been using to help her learn addition and how to tie her shoes, books that help us pray for different nations of the world and some other favorite books. I also created a special basket for my youngest with the books we are using now for kindergarten in our homeschool. 4- Get a subscription of Epic! After All, You Don’t Need To Spend A Ton of Money To Raise Good Readers. Almost two years ago we came across a children’s reading app called Epic! With Epic! 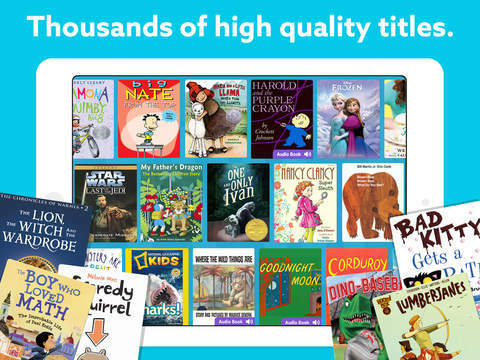 we can read the best children’s books of all time from our laptop, desktop computer or from our smartphones and tablets anytime we want, 24/7 for a super affordable flat fee subscription and no late fees. On Epic! each child have their own profile and the app select appropriate books for each of them according to their age and also allows you to set your preferences. All their reading is recorded. As a parent, I know who is reading what and how long they read each day, plus this pretty cool app gives the children badges as rewards for their reading time. What kid doesn’t like to be rewarded? So, How Epic! Help Us Raise Good Readers? Kids on Epic! can read as much as they want, anytime, anywhere (unlimited reading on the Web, Android, and iOS devices). Kids discover new books they’ll love with personalized recommendations based on their reading level and interests. Badges and rewards offer extra motivation to read. Popular and award-winning books and series include Ramona, Big Nate, Flat Stanley, National Geographic, Disney, Goosebumps, Ella Enchanted, Fancy Nancy, Warriors, and more. A wide range of fiction and non-fiction titles in a variety of formats including picture books, early readers, chapter books, Read-to-Me’s and Audiobooks. Our library includes more than 500 Spanish and bilingual Spanish/English books. In a recent survey of 1,000 teachers who use Epic!, 98% of educators would recommend Epic!. SHARE ME ON FACEBOOK AND TWITTER! In addition to being awarded the Parent’s Choice Gold Award and Mom’s Choice Gold Award, Epic! has also been featured in Parent’s Magazine, CNet, Parenting.com, USA Today and more. Think of Epic! as the Netflix of children’s books! Oh but these books are not just for leisure, they have amazing books and educational videos from Encyclopedia Britannica we use in our homeschool too! From Disney stories to history, science, biographies and much more, I absolutely love their content! Epic! can be used in your homeschool or classroom. As a matter of fact, teachers can get Epic! FREE to use in their classrooms! Today in our homeschool we learned about Egypt and Picasso and I found tons of books and educational videos on Epic! for my kids to further their learning. Epic! makes reading books and learning fun for the kids and for the parents too! I also love reading their books or listening to their audiobooks. Your Turn: How do you make reading part of your routine? What are your kid’s favorite books? Have you tried Epic! yet? We’ve never tried Epic (nor have I ever heard of it!). Luckily our library did away with late fees on books a few years ago so I just have to keep a close eye on our books on CD and our movies. Most anything checked out on a kids card can have fines or fees waived so even if they loose books it doesn’t cost me anything. Oh, what a blessing! Here we have to pay the late fees. 🙁 And hey, you should try Epic! free for 30 days we truly love it! So many great books, audiobooks and videos for the kids and even for ourselves. hehe Try it out and let me know what you think! Hi Anna, I love this list. I worried over raising good readers even though I loved books and reading. Thankfully numerous trips to the library when they were little and much reading aloud and they love reading 🙂 Great tips for moms! Sharing! Jen @Practical, By Default recently posted…Family Hiking Tips-Safety First! Thanks, Jen! I find that if we simply read to them daily as a natural habit it will become their natural habit too. 🙂 Thanks for stopping by and please link up with us today! Blessed MOMdays Link Up Party has just started and every Monday you can come link up your encouraging and inspiring blog posts here with us! 😉 Have a great week! I can totally relate to outrageous late fees at the library! Or having to buy the book because it had something spilled on it or torn out of it!!!!!!!!!! I’ll be checking out Epic. Thanks for sharing that. I also prescribe to the habit of reading up… we pick series (usually classic lit) that are way above the kids reading level and read through them as a family. Right now we are mid Chronicles of Narnia with our eye set on Farmer boy next. We love Epic!! And I do love that we can read classics books on Epic as well. We went through the whole Chronicles of Narnia last Summer, we love it! The Last Battle is our favorite. We are big Laura Ingels fans and we have Farmer Boy but we haven’t read it yet. LOL yes. Late fees are painful. We read the entire chronicles of Narnia last Summer and we loved it!! We have Farmer Boy but haven’t read it yet. Great tips! I always wonder if I’m doing enough for my little readers! I love to read, so hopefully I am passing that love on to them! Reading is such an intregral part of the learning process. When I realized my son had dyslexia, I found a way to teach him to read by skimming the pages instead of focusing on every word. He became a very fast reader and now in his 20s he is passing on his love for reading to his own little family! Our library offers three different online services that are free to us by entering our library card number as the login. These services allow us access to ebooks, audiobooks, and even movies. We’ve been particularly enjoying the audiobooks, because we can listen to these while doing other things around the house, and the narrators bring a lot to the story with character voices. I mention this because many libraries across the country are reducing their purchases of physical books and are instead purchasing licenses to these online services for their patrons. Thank you for the great reminders! I’m about to go read to my 2 youngest now (: I will look into Epic. I had never heard of it. Thanks! Reading has enriched my life so much. I NEED to instill that in my children. It sounds like I’m headed the same direction as you in a lot of ways. I hadn’t heard of Epic!, though. I’ll have to check that out. This article is so good, we have definitely upped our priority on reading this year, and rhe children are loving it! Reading the encyclopedia sounds like an awesome idea!! Never thought of that…. After Christmas, we will start that!